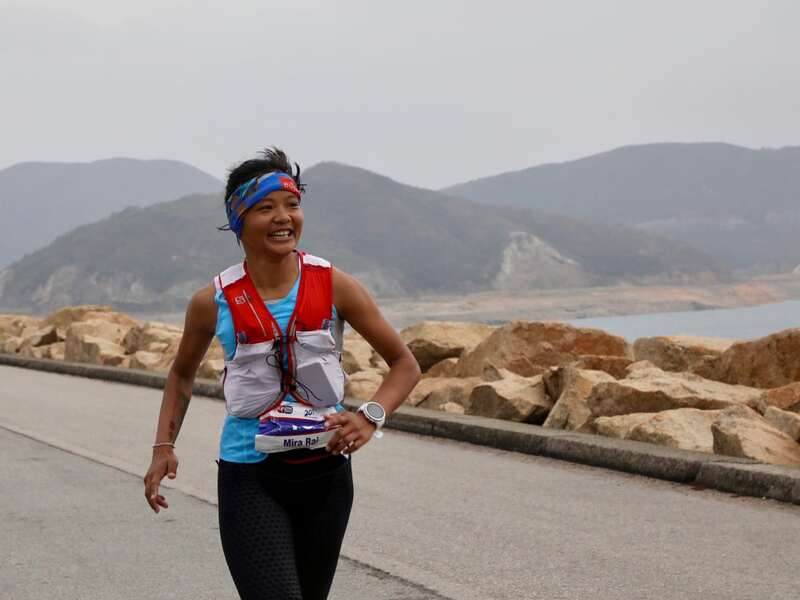 By running two very different races, China’s Min Qi and Miao Yao won the 2018 Vibram Hong Kong 100k. In the men’s race, a battle between two runners and the ultimate disqualification of one of them resulted in Min Qi’s victory. For the women, Miao Yao ran from start to finish way ahead of the rest of the field. 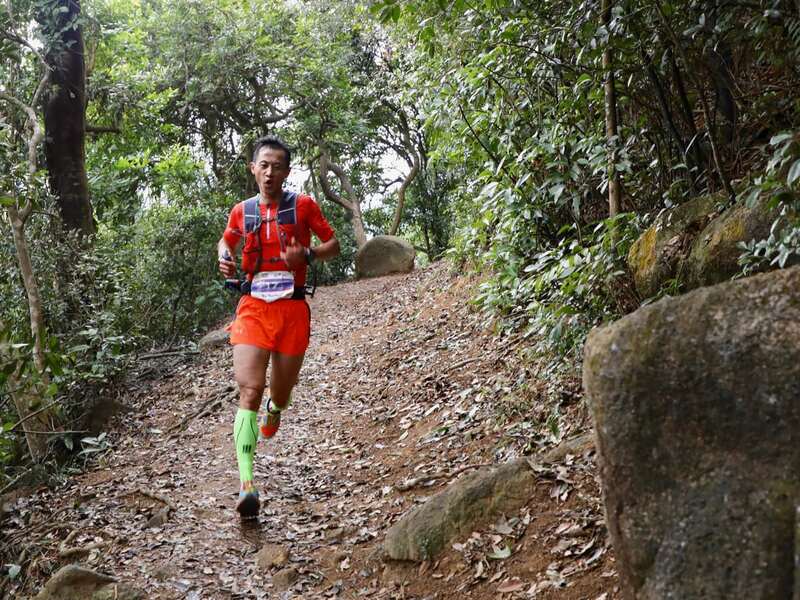 As the Vibram Hong Kong 100k was the first stop of the 2018 Ultra-Trail World Tour, Qi and Yao are the at-the-moment series leaders. China’s Miao Yao (post-race interview) took the race out fast, running ahead of men’s course-record pace for the first half of the race and running unchallenged by any other woman in the field. To be frank, it was not even close, not even at the beginning. Her finishing time of 10:40:52 broke Núria Picas’s course record, which she set at last year’s race in 11:18:57, by a margin of just under 40 minutes. Yao’s had a little over a year of success in trail ultramarathons in China, and said post-race that she has road-running experience as well. In her post-race interview, she expressed interest in taking her running international, to participate in internationally competitive ultras. One should expect her as a force to be reckoned with if she does. Second-place Mira Rai (post-race interview), of Nepal, showed that she is back in form after a lengthy knee injury, surgery, and rehabilitation. She ran in second position as early as about eight kilometers into the race, and I don’t believe she ever deviated from that position. Generally, she was several minutes in front of the women behind her, though that gap decreased in the race’s final quarter until Mira hammered hard for the race’s final few kilometers to finish more than five minutes ahead of third place. China’s Fu-Zhao Xiang keeps getting steadily better at this race! Last year, she finished fourth in about 13 hours. At the pre-race press conference, she stated her goal was to improve her 2017 finishing time. Looks like she did… by 90 minutes. Fu-Zhao started the race out easily, running in sixth place when we saw her first at 12k. By 36k into the race, Fu-Zhao had moved up into her ultimate third-place position. From there, the gap between her and the women behind her only increased as she maintained her speed and strength even during the course’s hardest terrain. From New Zealand originally, Hong Kong transplant Marie McNaughton (pre-race interview) represented the ‘home team’ well in taking fourth. Though she was ill earlier in the week and thought she might not even be able to start the race, Marie worked the race course steadily to finish for the fourth time–in her fastest time. Not bad for being under the weather! After a couple years of competing in shorter ultra-distance races, fifth-place Hong-Fen Zhang, of China, moved up in distance with this strong performance. England’s Sarah Morwood practiced perfect pacing, running outside the top 10 early and moving up later into sixth place. China’s Yan-Xing Ma ran as high as third place before slowing later to finish seventh. Iceland’s Elisabet Margeirsdottir and the USA’s Nicole Kalogeropoulos both ran in the back half of the women’s top 10 for most of the race. Stephanie Roland, who is from Namibia but who lives in Hong Kong, pushed late to occupy the final top-10 spot. Andrea Huser (pre-race interview) did not finish the race, citing fatigue from running 100 miles last month and jet lag. Well, I’ll remember this race for quite some time… but not necessarily for all the right reasons. I was told ahead of the race to be prepared to be surprised by the speed and strength of Chinese runners who I’d never heard of, and this was precisely how this race went down. At 12k into the race, the first five runners were Chinese and I’d never seen any of them race before. Within this lead pack, which ran into the 12k aid station more than six minutes ahead of course-record pace already, three of the five men would ‘stick it’ and finish at the front of the race. At the 28k point, Min Qi (post-race interview) emerged as the leader but with Jing Liang right behind him, only a few seconds back. The pair, both of China, ran close together and flip-flopping the lead until beyond the 52k aid station, where Liang broke from Qi and gained at least seven minutes of space. When we saw the pair next at about 76k, both runners looked tired but were still moving well. The gap between them reduced, however, to the point that Liang and Qi would finish within one second of each other at the finish line, with Liang breaking the tape. 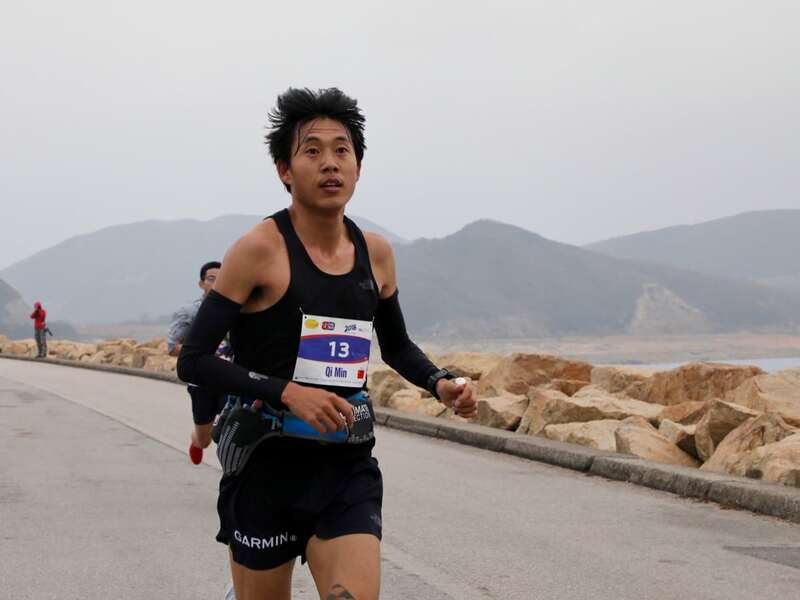 All was not well in this competition, however, as rumors (and social media) had been circulating for hours that a hiker was accusing Liang of cheating, and had presented evidence of it to the race directors. 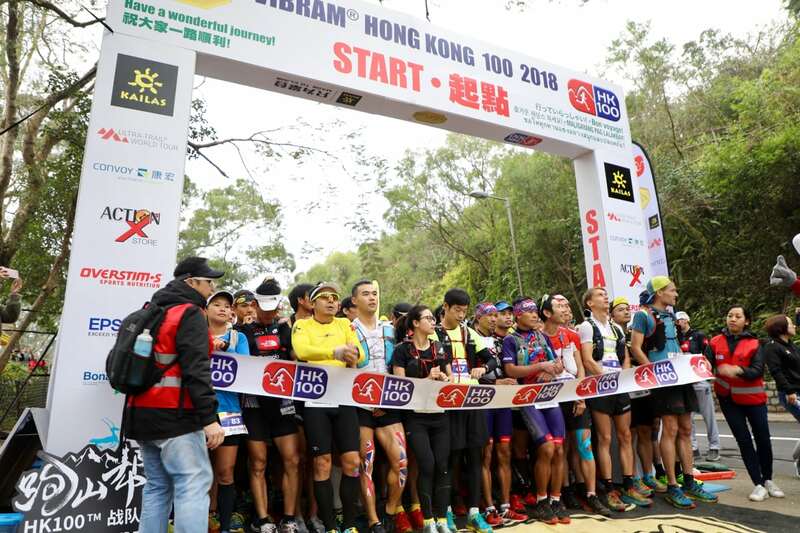 This all came to a head when, a minute or two before the pair finished, Vibram Hong Kong 100k race director Steve Brammar made an announcement at the finish line that, while race leader Liang was about to finish, his result was likely to not count due to inappropriate behavior. Brammar also said that the race organization would hear him out after finishing before making their ultimate decision, however. To be clear, the race’s rules state that support outside of aid stations isn’t permitted except in cases of emergency or if a runner purchases supplies from a hawker, restaurant, vending machine, or the like on the course. The rules also state that penalties and disqualifications may be applied at the organization’s discretion and are final. This made Min Qi the race champion. His finish time of 9:28:36 broke François D’haene’s 2016 course record of 9:32:26. That’s the end of my objective reporting on this incident, and here are a few words of authorial subjectivity, which I offer in light of this incident and several recent confirmed cheating reports in trail running and ultrarunning. Sports are essentially a game, and games have rules. In our sport of trail ultrarunning, the rules vary from race to race, but are put in place to attempt to level the game to a match of mind and body. It’s the responsibility of every ‘player’ to know the rules before they start the game, and to abide by them from start to finish. I applaud the race organization for its decision to act on an incident which not only was incongruent with the rules, but gave Liang an advantage over the rest of the runners. Tough action and reaction in circumstances like this aren’t easy, but upholding a high ethic so as to maintain the values of our sport is crucial. I hope all the sport’s participants choose this path going forward, as well. Let’s talk about the rest of the race. The USA’s Alex Nichols (pre-race and post-race interviews) was somewhere around 20th place at 12k into the race–not a disconcerting number of men in such a competitive race as Alex usually let’s the gunners fire things out. The disconcerting number, however, was that he was seven minutes back of the lead already. He would say after the race that he thought he was already running pretty fast at this point, and indeed he was. Twentieth place was just temporary, however, as another 10k later he was already in 10th. It went on like this, Alex picking off fast starters and those runners who excel less in technical terrain, until a little over 80k into the race where he’d moved into third place. Alex would also say after the race that, though he suffered a lull in the middle of the race, he was able to recover it and close strong. He crossed the finish as the third runner home, but was shortly upgraded to second place. China’s Yun-Hui Yu was fun to watch race. He whooped and hollered with joy several times when we saw him, quite obviously enjoying himself. Yun-Hui went out hard, running with or near to the lead pack for the first 20k or so. After that, he’d lapse back, playing chase for the rest of the race. Last year, he finished 13th in 10:53, and this year his effort of running some 49 minutes faster earned him the third spot on the podium. The best way to describe the performance of Nepal’s Purna Tamang is to say that he stuck it. He started out the race running in sixth place some 12k in, and finished in fourth place when it was all over. Though a few men came and went, moving ahead or lapsing behind him, he stayed steady–and smiling–all day. 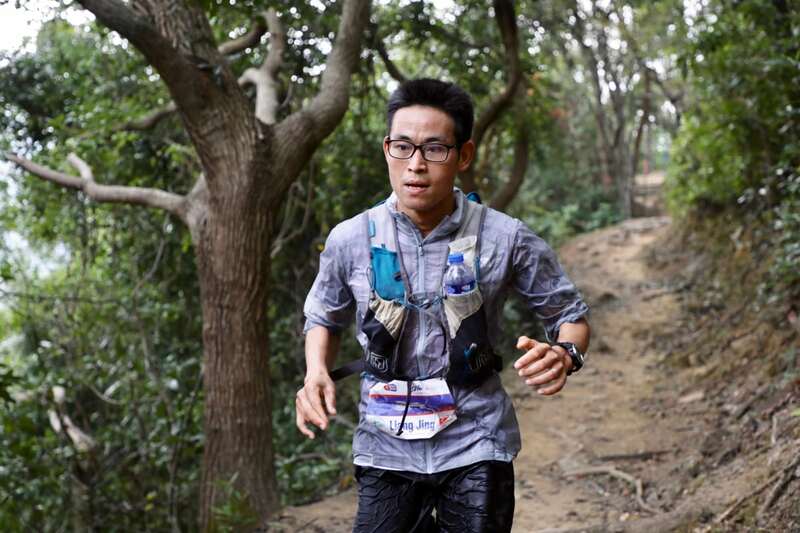 A member of the winning men’s Oxfam Trailwalker Hong Kong team for the last two years, he’s now found solo success on Hong Kong’s trails with fourth place here. Both Harry Jones, from Wales but living in Thailand, and John Ellis, an Australian who lives in Hong Kong, paced themselves expertly, running strong from start to finish and picking off carnage along the way. Ellis is a finisher of each of the race’s eight editions, but this is his fastest. 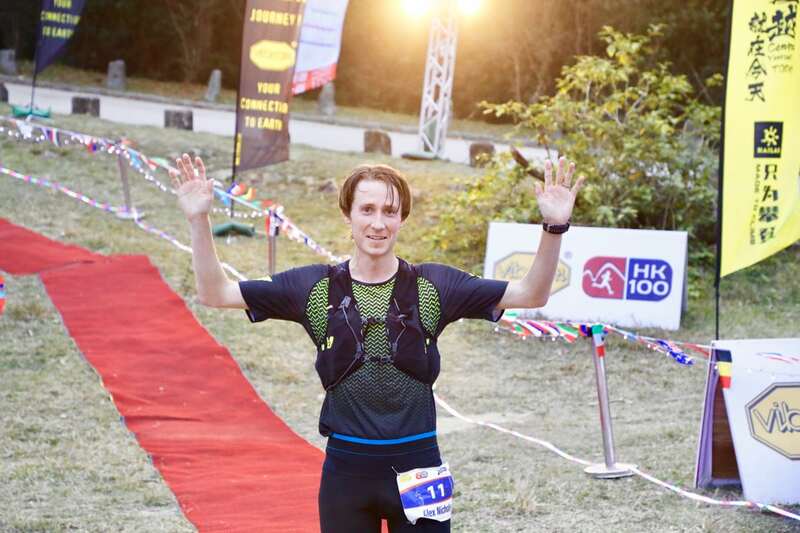 With his 10:35 finish, he improves his HK100 PR by some 55 minutes. Jones and Ellis went fifth and sixth. Nepal’s Suman Kulung took seventh place in a strong start-to-finish effort. Hong Kong’s Ho-Chung Wong ran across the finish line as applause and cheers roared through the crowd, he a clear hometown favorite. Brian McFlynn, an Irish runner living in Hong Kong, moved up in the second half of the race to finish ninth. Justin Andrews, an American living in China, also ran smart to take 10th. Thank you so much to Andre Blumberg, Paper Pongsubkarun, and Koichi Iwasa for their assistance in covering the race! Great breakdown as usual, Bryon. Could you enlighten us as to the Chinese ultra scene. You noted yourself that you did not know many or any of these runners – I imagine because, at least as far as I’m aware – they have not raced in the international events. Is there a Chinese system that provides the athletes with enough racing that they just haven’t ventured out, or what? Also, in this day of heightened awareness of and evidence for ‘not normal’ performances, I hope we can believe in these athletes’ results, especially since the men’s and women’s winners absolutely crushed the course records previously held by runners that are well known to the ultra world fandom. I’ll let me Meghan speak at to this year’s HK100, as she’s the one who was at the race, but China is a huge country with a number of ultras that have been around for years and HUGE growth in the number of runners, races, and even trail running camps in the past few years. It’s mindboggling in an amazing way. I forget the exact numbers, but within a few short years, China from having a handful of runners in each year’s UTMB family of races to one of the most represented countries at UTMB in terms of participants. The language and cultural barrier is huge (in terms of Westerners readily finding out info on runners), as are the distances between China and the US and Europe (participation in UTMB not withstanding), such that the Chinese ultra scene isn’t as visible outside of Asia as it might otherwise be. Still, we’ve seen Chinese runners with similarly fast marathon backgrounds as Dong Li and Long-Fei Yan run quite well internationally in recent years. The cost of racing in European and Americas are prohitbiting high, considering that Asian wages and currency Exchange are not that favourable to a normal wage earner. Also sponsorship are not common here, so Asian mostly race in local circuit. And yes there is plenty of races all year round in our playground. Those Asian runner are well know in local blog, English language media mostly don’t cover Asian event, so most remain unknown. Iaaf shows the womens winner Miao Yao with a 2:44 marathon last year. In that Wuhan marathon, there were 122,000 applicants for the 22,000 spots in the race. Did iRF interview the top finishers? Yes. We’re waiting to publish the winners’ interview until we have a written transcript and to publish additional interviews until we publish the winners’ interview. Thanks for your coverage, Meghan, and for your paragraph with commentary — it’s important, and I agree with your points! Miao Yao is listed in the elite entrants list for this year’s CCC. Looks like she’ll have a target on her from the rest of the field ! Sponsors/Tourism: Money injected into the local economies of many ‘out of the way’ and 1st-2nd-3rd tier cities has made, firstly road races, but now trail races a major source of local pride, tourism dollars, and publicity for these places. Some small towns that host a race could see a couple hundred runners come in for nothing more than a weekend race..and without the race, they’d never come (or know about the place, and they themselves are Chinese). It’s a booming sport, and the local tourism and culture boards see the $ to be made. Also, the average Chinese runner now has more vacation time and expendable income than ever before, and hmm, the air quality isn’t so good in a lot of cities as you may have read in the WSJ et al. So, if I and my friends have a free day or weekend, you can bet we’ll be spending it in the mountains training or racing! That trend is being repeated by the rising crowd of ultra runners in China, thus the West is now just seeing the large increase of Chinese participants and the accompanying rise of some stars. East Africa meets China: This is a non-researched hypothesis, but my take on it is this: East Africans are numerous in China nowadays, and invited elite numbers are ever on the rise. Take your B-tier Kenyan/Ethiopian who runs a 2:09-2:15 marathon and there aren’t very many Chinese who can beat them even on their best day. Suggest an average haul of 2-5k USD for a marathon in any given city in China and you’ve got yourself 10+ E. Africans present for a few prize money slots. Then, after a few years of getting solidly pummeled, some of these top Chinese marathoners who are 2:12-2:18 guys, figure out that the recent development of trail running in China has its perks–cash prizes not quite on par with road races but more than they’d earn in a month of work. Many trail races in China offer between 5000-20,000RMB (~800-3000 USD) and you can see why some Chinese would take their talent to the trails to pay the bills instead of getting pennies left over after 10 Kenyans beat you week in and week out. Banks, local governments, and race management companies may only pull a race off for one year in some places and it won’t be held the following year, but there are new races like that being set up every month across China. So, get in now and get the money while you can. And the sponsors who want you to represent their brand to 1.3 billion ppl. see it as even a turn-off if you only want to race internationally–can they compete with the likes of Nike, Salomon, UD, Altra, Hoka, and on and on the list goes? But happy is the domestic China sponsor who picks up a national or world-class local runner (English language not required, thanks very much) who has no big desire (or isn’t encouraged) to race internationally…but what if they did? China meets the world: HK100 and then UTMB, as Bryon mentioned above, in recent years have seen massive influxes of mainland runners. And while it may be a destination race, a ‘WeChat-worthy’ post, or a bucket list race for 98% of them, the 1 or 2% who are now coming to these races are indeed world-class runners. 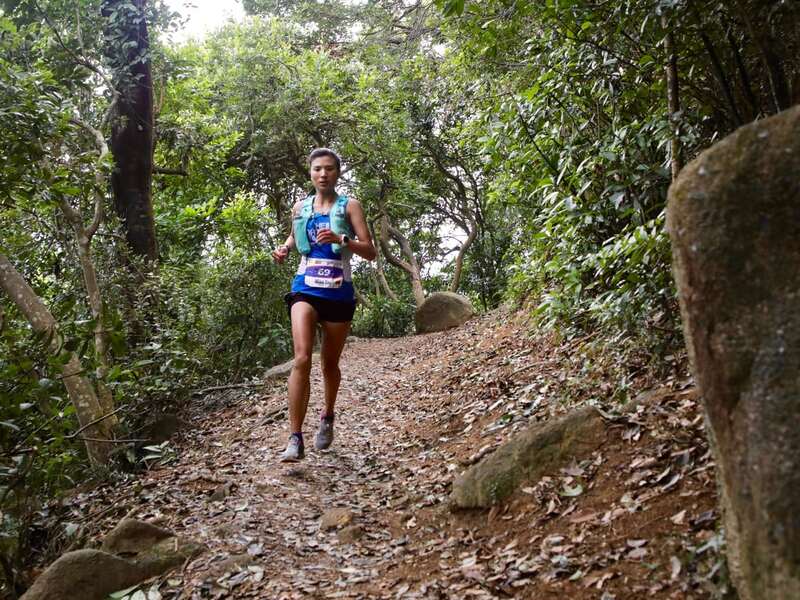 HK100’s course perfectly suits mainland Chinese runners who often train on similar terrain–rocky, root-strewn trails, lots of concrete and lots of stairs. That’s China’s parks-if they’re not concrete and stair-filled, they are largely undeveloped rough farming trails or wild tracks through which you’d be hard pressed to make an American race succeed on year 2 due to complaints from runners on how overgrown and unkempt the trails are. Altitude games: If getting high is what you’re into, China’s got that too. Fancy running at 5000-6000m; no problem. From my flat in Chengdu, elevation 550m, I can drive 3 hours to “Mt. Siguniang” and run/hike 3 hours…arriving at a 5028m summit. Can anywhere on Earth rival that? Altitude training options abound and for guys who want to take their running to the next level (or take on elites from the West who’ve come in for big races), they may well be hard to beat in time. Qi Min who won Saturday has beaten Francois and other Western elites head-head before in China. If he and his girlfriend, Miao Yao (yeah they’re dating!) end up racing in France this summer at the UTMB festival of races, watch out world. And sure, they’d be drug-tested, but I think they’re clean or at least will give them the benefit of the doubt. Living in China (and especially being Chinese) doesn’t exactly get you recognized unless you race internationally. YanLongFei and DongLi would be largely unknown runners to the Western ultra world had they not gotten picked up by Salomon and given the chance to race abroad. Though I don’t consider myself an elite runner, my 5th at UTA last May had iRF asking who I was (A) because I hadn’t gotten such a good result before because it was really my first race abroad (and the course suited me well, so that helped on the day) and (B) I lived in China. So even though I had gained some notoriety, it was only by the thousands of Chinese runners who know me on Chinese-language social media. I still on occasion get beat in my own backyard of Chengdu if the race is technical and slippery by local guys who may not ever race in HK or France…or they may eventually. But as pointed out above, there are many obstacles they must overcome. Vacation time from work, financial constraints, visa issues, etc all hinder these men (and the women who are in the own right, quite impressive) from going abroad for races that get covered here on iRF or by western ultra-running media. My impression, though, is that within another five years, some of these runners we are just starting to hear about will get some sponsors willing to pay their way to some big races (i.e. LiKuo, who finished just 2 minutes back of me in 10:52 at HK100 on Saturday, is sponsored by Colombia who paid his way to race CCC last summer), or just take the plunge and risk some hard-earned cash to take a trip to France or Japan etc in hopes of making a splash. I didn’t think Nuria Picas’ record would be broke for some time, but I think even Mira would break it next year with better training coming off her surgery last year. By the Numbers: The East coast from Beijing down to Shanghai and Shenzhen is leading the way, but further west where I live in Sichuan Province, the ultra scene has gone from something like 4 ultras in 2014 to over 22 in 2017. And with more money and more races still existing on the road scene, the E. Africans don’t have much incentive to leave the asphalt. Ultras I’ve raced in Sichuan have had 1-2k USD or so in prize money just for the champion; if you’re a fast road runner who came out of the government system and didn’t make the pro ranks, that kind of money is appealing for any athlete, let alone Chinese who make 500-1500 USD/month in the range of ‘menial service jobs’ to ‘decent office/desk job’. All for now, but that’s my 2 or 3 cents worth on the China scene. Hope that sheds a bit of light on the mainland ultra scene. Fantastic information! This comment should be promoted to a stand-alone article. Thanks! Thanks for the perspective! Agreed that this could be expanded to a standalone article. Qi Min and Miao Yao are both on the elite list for CCC ! Should be some fireworks on that course this year ! That’s a very sad DQ. It’s strange that a hiker would give someone water and then, as I understand it, that same hiker accused the runner of cheating. Sounds like a setup. Not following all the rules resulted in the DQ, but I think it’s too harsh to call it deliberate cheating. That’s something that you might not even think about. Also, why wouldn’t it be a case of emergency, if the race victory depended on having water or not? To summarise what was mentioned on social media (and in Hong Kong, it’s usually on Facebook) about Liang’s actions leading to his DQ, he was accused of grabbing the water bottle of a passer-by at 4 different locations: (1) at the 36k mark as Meghan has mentioned; (2) around Yung Shue O (~45k); (3) around Buffalo Pass (about 2k before Gilwell checkpoint, ~63k); and (4) another unclear location. Plus he allegedly pushed race volunteers at Kei Ling Ha checkpoint (52k). And he missed the entrance to the final 100m run in and failed to retrace his steps but instead ducked under the cordon tape. While the first of these raised the red flag, the culmination of Liang’s actions did not help him in the end. To our knowledge we don’t think this was a setup at all – though of course it can be a very fine line between what’s within the rules and what’s not. 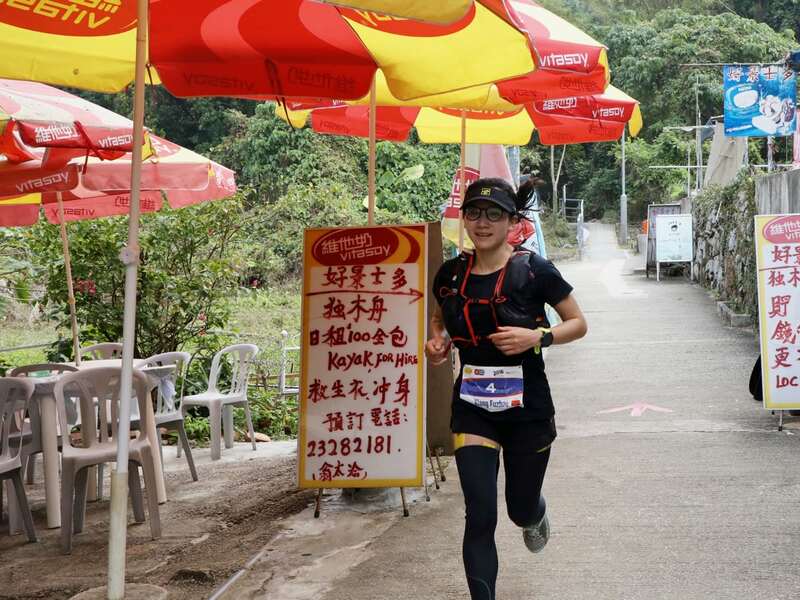 In my few years of participation in the Hong Kong trailrunning community (including as a tail-end finisher in this race), I have never heard, read or encountered such circumstances as that which unfolded here. The trailrunning scene here is similar in atmosphere and action to those in the US, Europe and elsewhere. Of course I can’t say, “there are no problems”, but none of the degree and brazenness as what was witnessed in this race. Clarification: I should have elaborated “grabbing” as “grabbing without permission, drinking and discarding the water bottle there and then”. In incidents (3) & (4), the apparent victims were race photographers. Was there any PED testing? This is a very relevant question, esp. applicable to any athlete that was part of a government system. Justin, thanks for the broad, in depth insight. This whole world of mountains and races in China is amazing and the pool of talent to be ignored at own peril of course. That’s a great comment Justin. Agree with ScottieB, re perhaps making it a main article or perhaps a one on one interview about the scene in China. Really added great insight and background to the weekend’s race.